The plant has four machines and six boilers, including two 50MW generators and two 25MW generators, four 75t boilers and two 220t boilers. Where 5# and 6# boiler are 220t. At present, 7# boiler (220t) is building. In addition to supplying power to northeast power grid, the plant also provides heat to the area. ID fan and FD fan of 220t boiler work in direct on line for long term. Air flow is adjusted by damper of ID fan and FD fan to maintain boiler negative pressure. Damper opening is usually 40%. In this way, much energy is wasted on damper. In summer, only one 220t boiler can meet load requirement. In winter, two 220t boilers usually work due to heat providing. Water feeding system is "one work one standby". When two boilers run simultaneously, flow and pressure of pump can meet requirement. When one boiler works, outlet pressure of pump is 15Mpa. But pressure demand is only 12.5Mpa. So high outlet pressure needs to be adjusted. Because pump is driven by motor of constant speed, water flow and pressure can be controlled just by valve of boiler. This method has inferior economic benefit, furthermore, high pressure endangers safe operation of pipeline. In order to solve above problems fully, the plant decided to reconstruct for four fans of 6# boiler and water feeding pump. By adjusting motor speed realizes flow and pressure adjustment to improve technics and save energy. Cascaded speed adjustment: it can recover slip power, so adjustment efficiency is high. But it is not applicable to squirrel cage asynchronous motor. It cannot realize soft start and start is very complicated. Adjustment range is limited. Response is slow, not easy to realize close loop control. Power factor and efficiency is low and lowers sharply with speed down. It is difficult to realize cooperation with PLC and DCS. It is not advantageous to improve automatization level and optimize control. In the meantime, because control device is quite complicated, with serious harmonic pollution to power grid, its application is limited. Hydraulic coupling speed adjustment: adjustment efficiency is low and adjustment range is limited. High speed slippage is about5%~10%. Slip difference loss is big in low speed. The max can reach to 15% of rated power. Efficiency is quite low during low speed range. Low precision, inferior linearity, slow response, big start current, big dimension. It has to be installed between equipment and motor, not applicable to reconstruction. It can implement soft start. When hydraulic coupling is broken, switching to direct on line is infeasible. Maintenance is complicated with much cost. It can not meet demand of high automatization level. Variable frequency speed adjustment: it adopts advanced power and electronic technology, computer control technology and communication technology. So it has advantages over other adjustment modes. The inverter has LCD interface and touch screen panel which can show voltage, current, frequency, speed at any time. Personnel can observe motor state at any time. High frequency resolution and adjustment precision meet technics requirement completely. The inverter has universal external ports which can connect to PLC and control machine, and also can connect to original control circuit, composing close loop system, such as data exchange and linkage with original DCS. The inverter has local control and remote control through internet. The inverter has power protection and electric protection which ensure inverter and motor reliable during normal operation and failure. Motor can realize soft start/stop. Start current is smaller than rated current of motor. Start time can be adjusted continuously, reducing affection on power grid. The inverter reduces wear and tear on auxiliary components, prolongs equipment lifetime and heightens production efficiency. Gozuk takes the biggest market share in China. System runs reliably. It has distinct technology predominance at reliability and safety. Inside PLC changes control logic easily, applicable to site need. According to actual state, "one drive one" (see following figure) is adopted. This is typical scheme of manual bypass. It is composed of three medium voltage isolators QS1, QS2 and QS3 (QF is medium voltage switch). 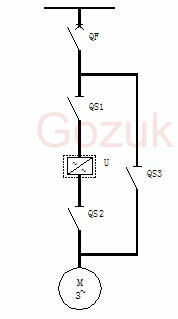 QS2 and QS3 interlock in mechanism and they can not close simultaneously. During variable frequency operation, QS1 and QS2 close，QS3 opens；in direct on line state, QS3 closes，QS1 and QS2 open. There is obvious power off points for inverter maintenance. System can switch load to direct on line manually. Above inverters arrived site on 19th August, 2005. As of 1 October, all installation and commissioning finished and inverters put into service. Total period is a month. We equip an upper PC which monitors four inverters in boiler control room. Modify original control circuit of medium voltage switch. Take a couple of normally open contacts from inverter controller to seal in off circuit of medium voltage switch. This node is defined as "permissible close". When inverter is supplied control power and self-checks normally, this node closes. Supply medium voltage power to inverter through original circuit. Take a couple of normally open contacts from inverter controller to parallel in off circuit of medium voltage switch. This node is defined as "emergency off". When inverter is serious failure during operation, inverter stops automatically, meanwhile, the node closes, medium voltage switch trips. In addition to above modification for medium voltage switch, before start inverter, we cut off original differential protection of motor. If motor needs to switch to direct on line, the protection is valid. Frequency inverter is installed beside pump. Upper PC is installed in pump control room. Make similar modification for medium voltage switch to meet inverter operation requirement. Four inverters of fans have been running normally since they put into service. Because 6# boiler does not adopt DCS control, installation space of boiler control panel is limited. Inverter does not use hard wire to implement remote control, but by an upper PC. Because upper PC can not be installed right ahead of fireman, it is difficult to ensure operation in time. So damper is still needed when inverters work. That is, according to load state, adjust inverter to lower frequency by upper PC (usually at 40Hz). Damper opening is about 80%. When air flow needs fine adjustment, personnel adjusts damper to ensure timely adjustment. Frequency inverter for pump has been running stably since it put into service. During single 6# or 7# pump operation, pump is controlled by inverter. All valves are full open. In winter, 6# and 7# boilers work together. Single pump should run in full load to meet load demand. So inverter exits and motor runs in direct on line. After 7# boiler put into service, two pumps work together. One works in direct on line and the other works in variable frequency. Variable frequency pump supplements water feeding. Note: 6# boiler works for 10 months every year. From operation state of several months, Gozuk inverter has good performance and high reliability. Energy saving is obvious. It meets requirement of continuous production, reaches purpose of energy saving and technics improving. At present, the plant is purchasing eight frequency inverters again from Gozuk for reconstruction on 5# and 7# boilers. The inverters are producing in factory now and they will apply successfully in future.